Rajasthan Gram Sevak Syllabus 2016:- Raj Gram Sevak Bharti 2016 Latest Syllabus according to the New Exam Pattern are available here. Candidates can Download the Rajasthan Gram Sevak 2016 Syllabus pdf by click on the Link Given below. We Update here all Important Questions & Previous Year Question Paper. राजस्थान ग्राम सेवक भर्ती सिलेबस 2016 टॉपिक वाइज यहां दिया गया है ! सेलेबस से संबंधित किसी भी प्रकार की समस्या हो तो आप कमेंट के माध्यम से हमारी टीम से पूछ सकते हैं ! 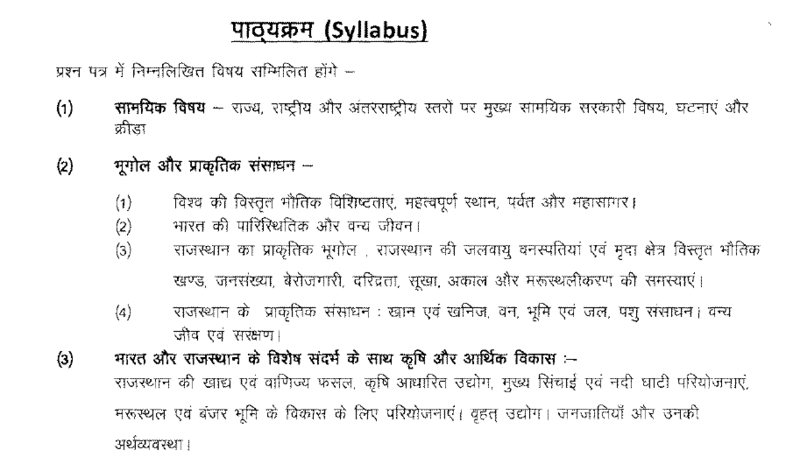 According to the Raj gram Sevak New Syllabus the Questions Asked in the Written Exam From the Following Topics. Students Must Clear all these topics to Qualify the Written test. The Level of all Questions (Hindi. English. Maths ) is Based on the 10th class Standard. Rajasthan GramSevak Exam analysis is Describe here Read carefully. In the Exam Pattern, we Discuss the how Many questions are asked in the Written Test, Minimum Qualification Marks, Total Time Duration of Exam etc. Total Number of Question:- 100 Q. All Question in Written Exam is Asked from Raj Gram Sevak Bharti Syllabus 2016 Along with the course books you can also refer to the model test papers and the solved paper. With the help of all this study material, you will be able to get an idea of the process of examination along with the time that it will be taken to complete the examination paper. All the above-mentioned subjects carry a different kind of marks distribution. Maths ka portion kya rhega? Any idea? Gram sevak me math or English me kya aayga? gram sevak exam ka subject wise full sellebas bhejo or par sub. kitane number ka hoga. Sir gram sevak syllabas me hindi english maths gk computer Reasioning ye sab me se konsa subject kitne no. Ka hoga eski jankari chahiye.